Coordonnateurs : Croft Darin A., Su Denise F., Simpson Scott W.
This volume focuses on the reconstruction of past ecosystems and provides a comprehensive review of current techniques and their application in exemplar studies. 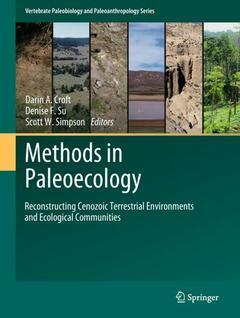 The 18 chapters address a wide variety of topics that span vertebrate paleobiology and paleoecology (body mass, postcranial functional morphology, evolutionary dental morphology, microwear and mesowear, ecomorphology, mammal community structure analysis), contextual paleoenvironmental studies (paleosols and sedimentology, ichnofossils, pollen, phytoliths, plant macrofossils), and special techniques (bone microstructure, biomineral isotopes, inorganic isotopes, 3-D morphometrics, and ecometric modeling). A final chapter discusses how to integrate results of these studies with taphonomic data in order to more accurately characterize an ancient ecosystem. Current investigators, advanced undergraduates, and graduate students interested in the field of paleoecology will find this book immensely useful. The length and structure of the volume also makes it suitable for teaching a college-level course on reconstructing Cenozoic ecosystems. Dr. Darin A. Croft is an Associate Professor in the Department of Anatomy at the Case School of Medicine in Cleveland, Ohio. Dr. Scott Simpson is an Associate Professor in the Department of Anatomy at the Case School of Medicine in Cleveland, Ohio. Dr. Denise F. Su is the Curator and Head of Paleobotany and Paleoecology at the Cleveland Museum of Natural History.